What is the Extra-Cellular Matrix ( ECM ) ? The ECM is the living environment of your cells in the same way that the village or town you live in is your living environment. The build-up of toxicants in the ECM will result in cellular disease and eventually dedifferentiation since toxins in the extra-cellular matrix can disrupt the intra-cellular matrix and even the intranuclear matrix, so that disease can develop even if the toxin is not directly in that location. You can easily image that people living in a very polluted environment will be increasingly prone to various diseases, including cancer ( cellular dedifferentiation ) . The same is true for your own cells. 1) Mechanical support for cells and tissues. 2) Influences cell shape, cell movement, cell development and cell differentiation. 3) Coordinates cellular functions through signalling with cellular adhesion receptors. 4) Reservoir for extracellular signaling molecules. 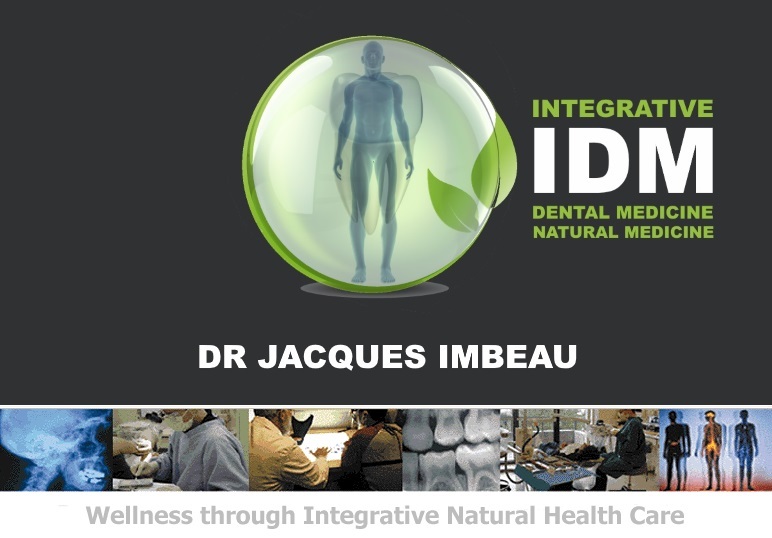 Thus a healthy, functional ECM is very important for cell health. 3) Proteoglycans - complex proteins and long chains of repeating disaccharide units called glycosaminoglycans (GAGs, such as: hyaluronic acid, chondroitin sulfate, heparin, heparan sulfate). Collagens are the most abundant proteins found in the animal kingdom. It is the major protein comprising the ECM. There are at least 12 types of collagen. Collagens are predominantly formed by fibroblasts but epithelial cells also synthesize these proteins. Fibronectins attach cells to a variety of extracellular matrices. Fibronectin attaches cells to all matrices except type IV that involves laminin as the adhesive molecule. Laminin anchors cell surfaces to the basal lamina. All basal laminae contain a common set of proteins and GAGs. These are type IV collagen, heparan sulfate proteoglycans, entactin and laminin. The basal lamina is often referred to as the type IV matrix. 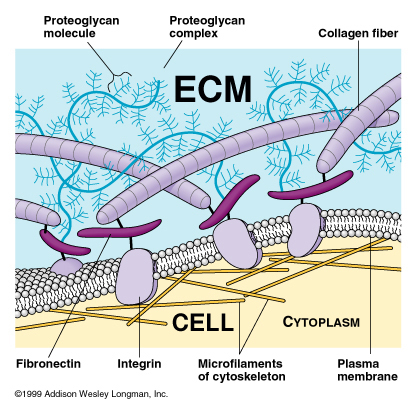 Many cells bind to components of the extracellular matrix. The cell to ECM adhesion is regulated by specific cell surface cellular adhesion molecules (CAM) known as integrins. The integrins transmit mechanical stimuli from the ECM to the cytoskeleton.